Astronomers believe they have caught the exact moment a black hole was born on camera for the first time. Immensely powerful telescopes spotted the phenomenon occurring last summer, which was 100 times brighter than a supernova. 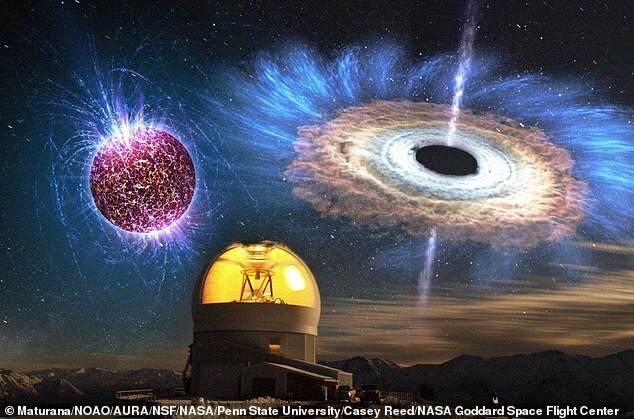 Researchers say the spectacular sight, which occurred 200 million light years away from Earth, was the birth of a new black hole or neutron star. However, the scientists who spotted the moment in real time are currently mystified by what ‘the Cow’, as they have nicknamed it, really is. Particles were found to be flying out of the object at a staggering 95 million feet per second – a tenth of the speed of light. Researchers have given the mysterious object the moniker ‘the Cow’ as a shortened version of its much more complicated scientific name – AT2018cow. A sky survey telescope in Hawai’i observed the mysteriously bright glow on June 17, 2018. It was similar to a supernova, a sudden explosion of a massive star which has reached the end of its lifetime, leading to the formation of a black hole or neutron star. The theory was backed by a multi-institutional team after combining several imaging sources, including hard X-rays and radiowaves. 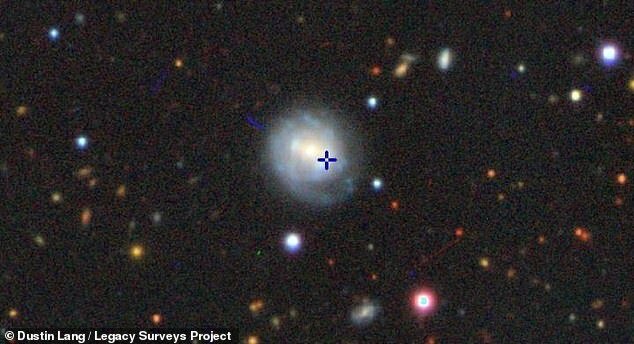 Assistant Professor Dr Raffaella Margutti, of Northwestern University in the US, said: ‘We thought it must be a supernova. 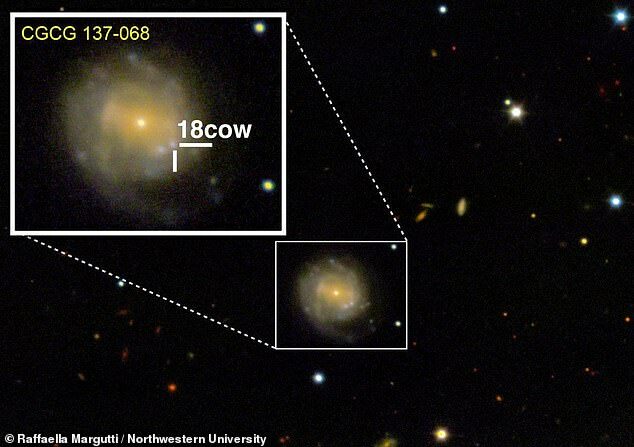 ‘We think that “The Cow” is the formation of an accreting black hole or neutron star. Within just 16 days, the object had already emitted most of its power. In a universe where some phenomena last for millions and billions of years, two weeks amounts to the blink of an eye. 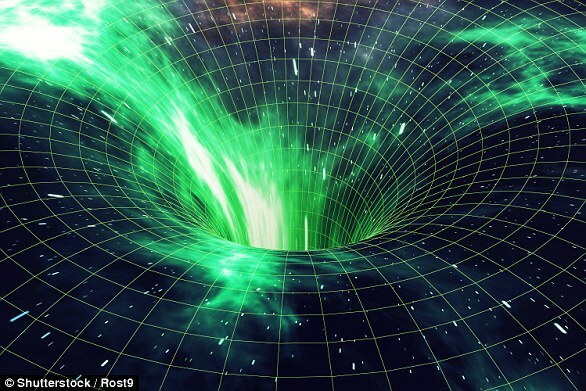 Black holes are so dense and their gravitational pull is so strong that no form of radiation can escape them – not even light. They act as intense sources of gravity which hoover up dust and gas around them. Their intense gravitational pull is thought to be what stars in galaxies orbit around. Astronomers believe they may form when a large cloud of gas up to 100,000 times bigger than the sun, collapses into a black hole. Many of these black hole seeds then merge to form much larger supermassive black holes, which are found at the centre of every known massive galaxy. Alternatively, a supermassive black hole seed could come from a giant star, about 100 times the sun’s mass, that ultimately forms into a black hole after it runs out of fuel and collapses. When these giant stars die, they also go ‘supernova’, a huge explosion that expels the matter from the outer layers of the star into deep space. Professor Margutti added: ‘We knew right away that this source went from inactive to peak luminosity within just a few days. The Cow’s chemical composition was also examined finding clear evidence of hydrogen and helium, which excluded models of compact objects merging like those that produce gravitational waves. Astronomers have traditionally studied stellar deaths in the optical wavelength, which uses telescopes to capture visible light. The new study viewed the object with hard X-rays, which are ten times more powerful than normal radiation – including radio waves and gamma rays. Neutron stars are the collapsed, burnt-out cores of dead stars. When large stars reach the end of their lives, their core will collapse, blowing off the outer layers of the star. This leaves an extremely dense object known as a neutron star, which squashes more mass than is contained in the sun into the size of a city. A neutron star typically would have a mass that’s perhaps half-a-million times the mass of the Earth, but they’re only about 20 kilometres (12 miles) across. A handful of material from this star would weigh as much as Mount Everest. They are very hot, perhaps a million degrees, highly radioactive, and have incredibly intense magnetic fields. This makes them arguably the most hostile environments in the Universe today, according to Professor Patrick Sutton, head of Cardiff University’s gravitational physics department. The dense objects, in particular their cores, are key to our understanding of the universe’s heavy elements. This enabled the astronomers to continue studying the anomaly long after its initial visible brightness faded. The scientists also benefited from the star’s relative closeness to Earth. Professor Margutti added: ‘Two hundred million light years is close for us, by the way. The findings were presented at the annual meeting of the American Astronomical Society in Seattle, and published in the Astrophysical Journal.